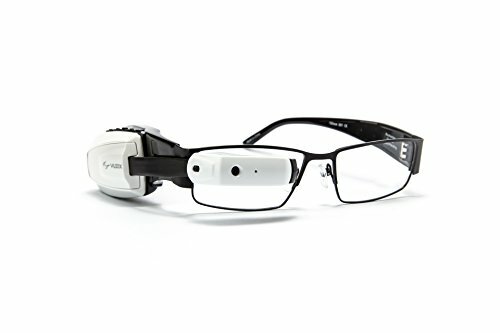 The Vuzix M100 Smart Glasses is an Android-based wearable computer, enhanced with a wearable monocular display and computer, recording features and wireless connectivity capabilities designed for commercial, professional, and prosumer users. Its pre-installed apps can be used to record and playback still pictures and video, track timed events, manage your calendar, link to your phone and more. The M100 is compatible with thousands of existing Android apps and easy access to developer resources enables the creation of custom apps to suit virtually any need. Vuzix M100 provides the features and capabilities of a modern smartphone, without a cellular radio, in a hands-free wearable device. Bluetooth 4.0 connectivity makes it easy to pair with another Android device or connect wirelessly with Wi-Fi to the Internet. The M100's integrated camera captures 5 megapixel still images and 1080p high-definition video. Video and image capture can be stored directly on the M100's memory (expandable up to 32 GB) or streamed live. If you have any questions about this product by Vuzix, contact us by completing and submitting the form below. If you are looking for a specif part number, please include it with your message.